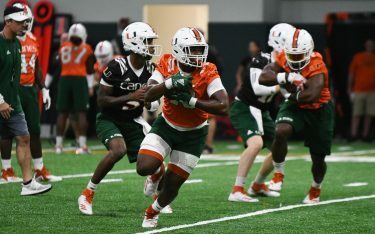 The University of Miami endured a disappointing regular season, but the Hurricanes’ lackluster record is not the only thing that seems to have fans in a funk. 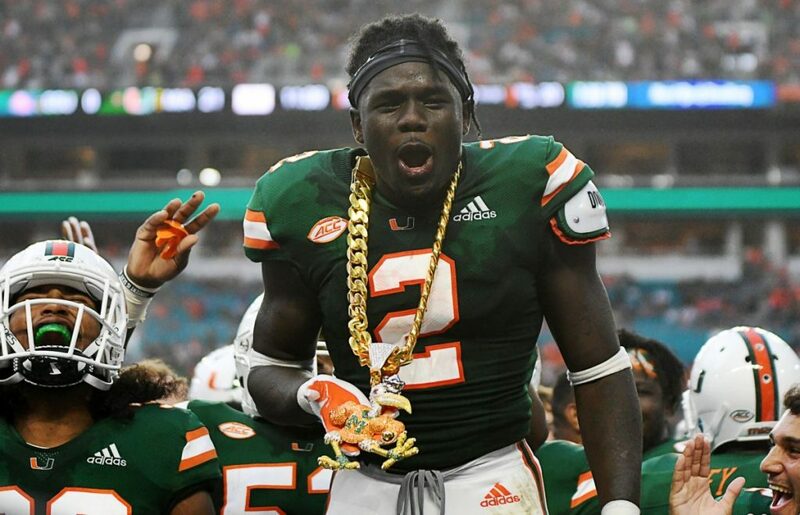 While some are questioning coaches about controversial game plays, others are wondering why coaches tinkered this year with the U’s flashiest icon – the immensely popular Turnover Chain. 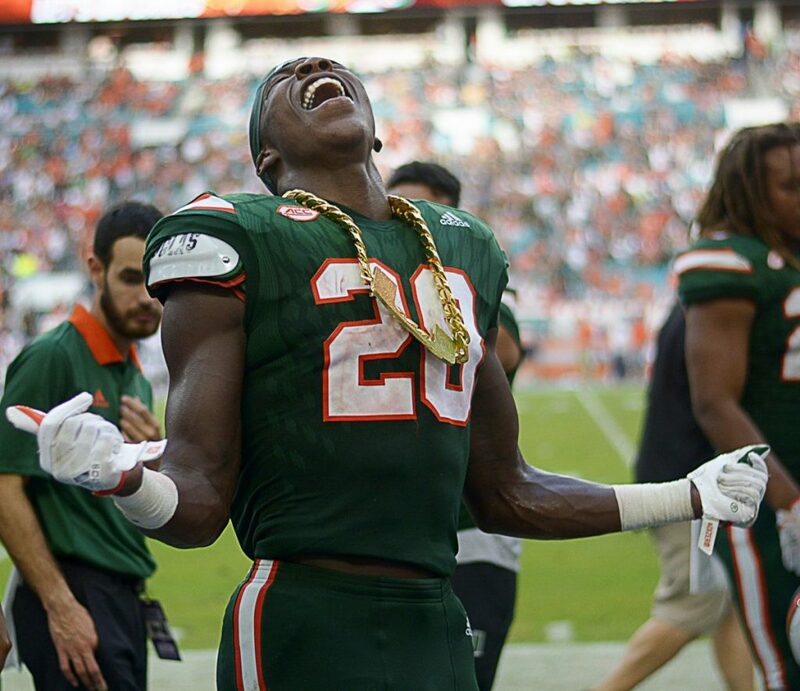 Created by local jeweler Anthony John Machado, “The King of Bling,” the 2017 Turnover Chain sported an orange and green sapphire-encrusted “U” medallion attached to a 10-karat gold link chain weighing 4.4 pounds. Football players flaunted the chain on covers of magazines, newspapers and websites. Thousands of fans wore printed versions on their T-shirts, and several university teams devised copycat spinoffs. “Whenever they bring it out during the games, the stadium goes nuts,” said Ian Malesiewski, a freshman neuroscience major. But this year, UM coaches decided to make some changes. The new reveal happened Sept. 8, when Canes cornerback Trajan Bandy dawned the new Turnover Chain after recovering a fumble during the second quarter against Savannah State. 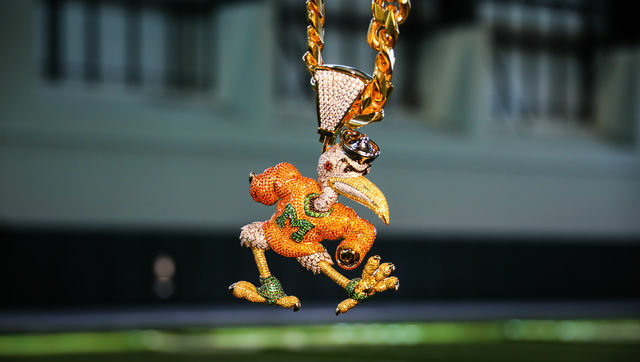 The U is replaced with Sebastian, UM’s mascot, decked out in 4,000 semi-precious stones. At 8.5 inches wide, the chain is three inches wider than the original, and nearly 2.2 pounds heavier. “Honestly, the Ibis just took the Turnover Chain to the next level with the detailing, the size, the weight and a throwback to Miami’s original swag with the old-school Sebastian,” Machado said. Did coaches make a bad call to bench the U and bring in Sebastian? 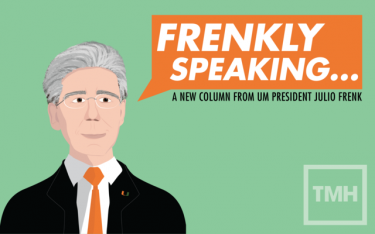 The Miami Hurricane interviewed about 150 UM students, staff and faculty in October and November about their preferences. The majority of the respondents – more than 80 percent – are giving the new chain a thumbs down. “The bird looks tacky,” said Emily Tsokopoulos, a fall transfer student who has had season tickets for the past two years. Others said the new medallion was too big. “It’s so big, and looks like it came out of a cereal box,” said Talia Mereles, a broadcast journalism major. Some, like Makelsey Page, said they did not take issue that Sebastian replaced the U, but said the look is overwhelming. “The actual execution, with all of the gems, makes it look very busy and a bit too much,” said Page, a marine science and biology major. Several survey respondents, including math lecturer Joy Beverly, said the new chain is not aesthetically appealing. 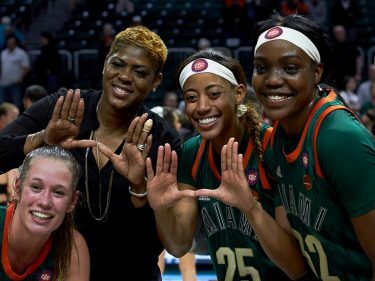 “I prefer the U because I find beauty in the symmetry of the design,” said Beverly, who attends a couple of games each season. Beverly said she likes the reason behind the chain even more. Lien Tran, an assistant professor of interactive media, also said she liked the U medallion for its simplicity. “The new Sebastian design has some amazing craftsmanship and details up close from what I’ve seen in the photos, but these are things that probably aren’t so discernible in the media coverage of the games,” Tran said. Sebastian may be good on the field to rouse the fan base during games, but the U is what people know, many of those surveyed said. 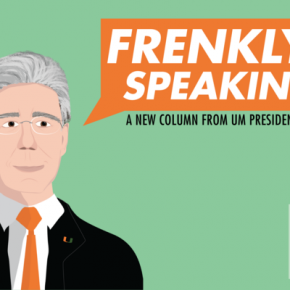 Brian Weinblatt, senior director of development at School of Communication, said the U is part of the official UM logo. The team should have kept “one of the most recognizable brands in higher education” on the turnover chain, he said. Caitlyn Tolchin, a sophomore studying sports administration, agrees that the U is more recognizable. Sophomore Tiffini Roberti said she agrees. Like many respondents, Jailah Williams, a freshman criminology and international studies major, said Sebastian draped in 4,000 stones is overkill. “I get that it’s supposed to be all about charisma, but it’s just too loud,” Williams said. But loud and flashy are what Jordan Craft, a management and marketing major in the Miami Business School, said he likes about the new chain. Virgilio Capote, a senior communications major, said the ibis better represents the university. Machado said he and the Canes’ defensive coaches collaborated on the new design. The more bling, the better, said professor Tom Koulouris, who teaches construction management in the College of Engineering. "Turnover Chain 2.0" weighs roughly two pounds heavier than the original version and holds more than 3,000 additional stones. Initially, the Turnover Chain seemed like a lucky charm, not only for U swagger but for the team’s defensive performance. In 2016, the season before the chain was introduced, the Hurricanes had 19 turnovers. In 2017, Miami forced 31 takeaways. But this year there has been a drop-off. The Hurricanes have accumulated 24 turnovers heading into their bowl game against Wisconsin. While some published reports say the heavy, jeweled chain costs nearly $100,000, university officials have not talked about how much the school actually paid for the chain or how it financed the costs. Hurricane fans, however, have their ideas. “I’m sure the chain was given by some philanthropists, probably not paid by UM funds,” said George Gonzales, a political science professor. Eli Anton, a freshman economics major, said he’d rather see the school investing in projects that would benefit the general student body, such as more microwaves in the food court and better meals in the dining halls. “That’s my whole $70,000 tuition right there in one chain,” said freshman Tavia Cox. Whether they are for or against the changes, many say they don’t understand why a change was needed after one season. Coleman Ayers, an exercise physiology major, said he agrees that a new chain each year is a good business investment for the university. Eventually the profits from merchandise inspired by the chain will compensate for the money spent on the actual chain itself, he said. Valory Greenman, a senior program coordinator, said if the university wants to retire the chain each year, it should benefit students. “What they should do at the end of each season is take the retired chain and auction it off to benefit academics or students with financial needs,” Greenman said. Coaches slipped out the new turnover chain without warning, and there is no word that a new one is in the making. If turnover chain 3.0 is to come out next season, Machado said he will need a few months to prepare. “A design of that type of caliber involving such an intricate detail and the amount of stones that are set onto the pendant takes about four months from start to finish,” Machado said. Machado encourages fans still in love with the first Turnover Chain to not despair. “Both designs have been outstanding, and the first chain started a trend in college football, so it will forever hold a special place,” Machado said. 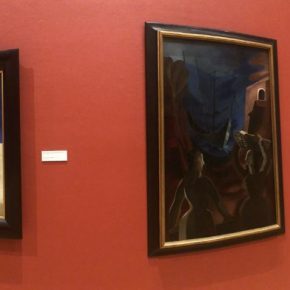 Abigail Adeleke, Danyel DeVilliers, Alexis Duhaney, Emma Erickson-Kerry, Rebecca Goddard, Ellie Horwitz, Glen Howard, Tre’Vaughn Howard, Aline Jean, Naomy Lelis, Iris Maryland, Melissa Mended, Morgan Threatt, Maxwell Trink and Coco Rominger contributed to this story.